Project Unbreakable is an online photography project that aims to "encourage the act of healing through art." Trigger warning for sexual assault. This is Grace Brown, the 21-year-old founder of Project Unbreakable. Two years ago, Grace began photographing survivors of sexual assault holding up posters on which they quoted their attackers. Since its founding, the project has showcased over 2,000 survivors' stories. The only requirements are that submissions be nameless, and within quotation marks. Below are a few poignant examples. 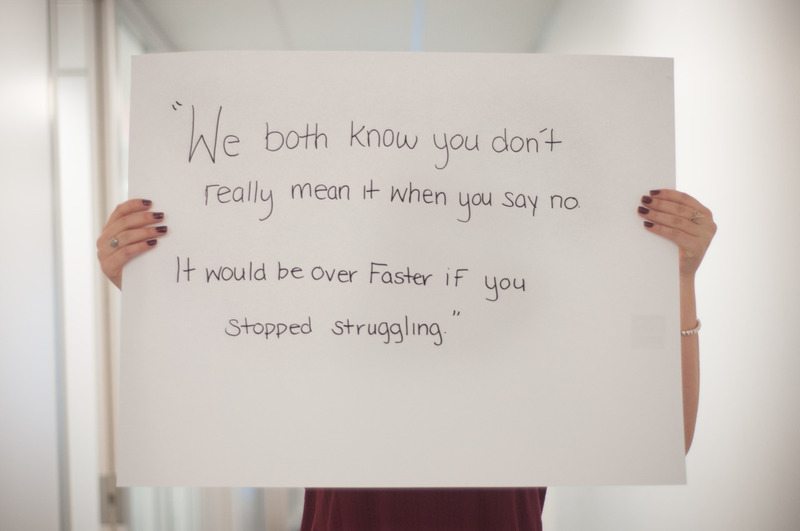 This image, along with a few others submissions on Project Unbreakable, was featured in an article on The Society Pages, which drew comparisons between the language of sexual assault and the lyrics of Robin Thicke's "Blurred Lines."